Erin's back, at your request, with a lovely, flexible, and simple main dish. Undoubtedly, her kiddoes think it is delicious as well! 😀 Thanks, Erin! Oh the flexibility of this recipe! Makes it a bit intimidating to type it down for you. Please feel free to tweak, add, and substitute till your heart's content. What's fresh and growing in your garden? What did you spot at the farmer's market? Craving a certain herb or spice? Have a few leftovers in the fridge that need to be used up? Create away! Have fun. Enjoy the colors and flavors of spring! 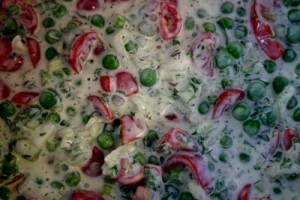 This delicious salad compliments a plate of salad greens beautifully and tastily fills a homemade flour tortilla. It will also hold its own as a light main course. The night before you make this salad, soak your rice. This would also be a great recipe to use up leftover rice. 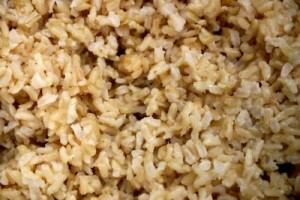 Soak 2-1/2 cups of brown rice in 5 cups of warm water and 5 tablespoons of whey for at least 7 hours. Drain off the liquid and combine the rice, 4-1/2 cups of water, and a couple pinches of salt in a large sauce pan. Bring to a boil. Turn down heat. Cover. Allow to simmer for about 40 minutes. Check toward the end of cooking time to see if all the liquid has been absorbed. If so, fluff with fork, and allow to cool uncovered. 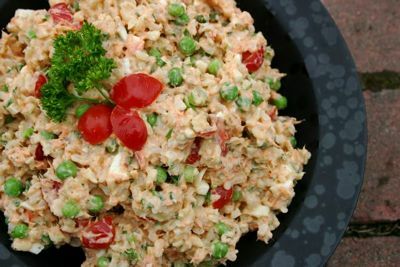 In a medium size bowl combine yogurt, mayo, chopped tomatoes, peas, green onions, grated and squeezed cucumbers, chopped hard boiled eggs, dill, parsley, curry, and lemon juice. Stir. Give it a taste. Add some salt and pepper. Taste again. Take another look through your fridge. Anything else you want to add? Go for it. 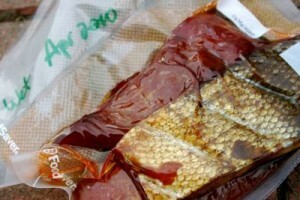 Combine sauce with the flaked smoked salmon and rice. Stir well. Add more yogurt/mayo if you'd like a saucier consistency. Try a taste. Adjust your seasonings. Top a salad. Fill a tortilla. Spoon into a bowl. Most importantly, ENJOY! 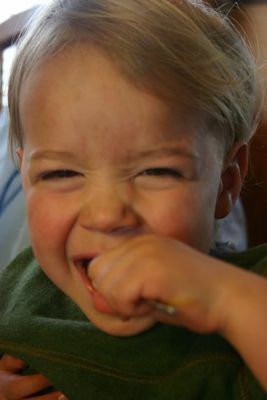 This post was featured in 33 Nourishing Main Dish Salads. Thanks Robin. 🙂 I think it would be equally delicious with leftover roasted chicken or turkey. 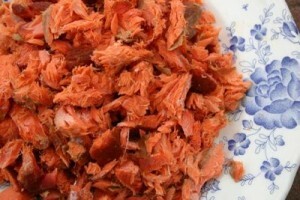 We, however, happen to be blessed with an abundance of salmon up here in AK! It’s also an easy recipe for using up what we have hanging around in our fridges, and that’s always nice! Erin, you’re so blessed to live in Alaska for the fish! I am going to make your salad this weekend for company, but using quinoa (I’m out of rice). What a great summer-y food, too! I could see this going over well at picnics and potlucks! Thanks for sharing, Erin! Yum! What a great idea for a salad. 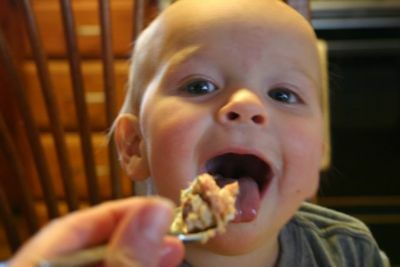 I am trying to incorporate more salmon in our diets, and nice to see the kids liking it! Thank you Lynsey! I’m sure fresh cooked salmon would also work nicely in the salad. You may need to up the herbs/spices a bit since you wouldn’t be getting that nice smoked flavor. Let me know if you give it a try! This looks yummy! I am doing a grain free / dairy free diet at the moment for my daughter who has colitis. Does anyone have ideas how I can tweak this recipe? I am not very good at that yet!! Erin – I still consider it a grain, but it has been simplified into simple sugars, like a vegetable. I don’t think it would work as grain-free. Jaylene – Hmm… thinking… How about upping the veggies, adding more of them (corn/peas/bell peppers/cucumber/shredded carrot), making it into more of a slaw, and tossing it all in the mayo dressing? Erin – Wonderful! I made this last weekend (later than I planned) and we loved it. I do wish I’d had smoked salmon; that would have been even more wonderful! Oh, and I wish I had peas, too! 😉 I “made do” with chopped crispy nuts, leeks, wild salmon, and olives for the add-ins. Thanks for a great recipe. Karen, thanks for the reminder! You are so sweet. 🙂 I’ll try to find you a bagel recipe, too. Great idea! So glad you are enjoying the english muffins. i’m going to start some soaking today. Smoked salmon is one of my favorite ingredients, but I have never thought to use it in a salad like this.